If you like spending your vacation in the great outdoors, then national parks are great places to visit. Of course no vacation would be complete without your best friend, so why not plan a road trip with your bulldog? Vacationing with your bulldog requires a little extra planning; you have to make sure your buddy will be welcome where you want to visit. The bad news is that most national parks are off limits to dogs. But the good news is that a few of them are dog friendly! Check out my picks for the top 5 national parks for you and your bully. Of all the national parks in America, this one has the best combination of dog access and natural beauty. This park welcomes your bully on 45 miles of carriage roads and 120 miles of hiking trails, with the exception of a few trails that require ladder climbs. Obviously, a rigorous hike would not be the best choice for your bulldog, but no worries. Acadia National Park offers plenty of short, easy hikes. I recommend you check out the Jordan Pond Nature Trail. It’s a one mile loop that leads to breathtaking views of glacial mountains and ponds that reflect the mountains. Here’s a tip if you like to avoid a lot of people. Check out the western part of the park and the trails across Somes Sound, which is America’s only fjord. Swimming beaches are off limits to your bulldog in this park, so tell him to pack his hiking shoes and leave his swimming trunks at home. I made this park my second pick because it is 100% dog friendly. Not only are dogs welcome in the park, but they are also welcome at the adjoining preserve. There’s a lot more than sand dunes to see in this park. It features a diverse landscape of grasslands, wetlands, evergreen forests, and even tundra. If your bulldog likes to play in the water, then you need to take him to Medano Creek. The water in this creek surges and causes mounds of sand to collapse. Your dog will love to dig in it! 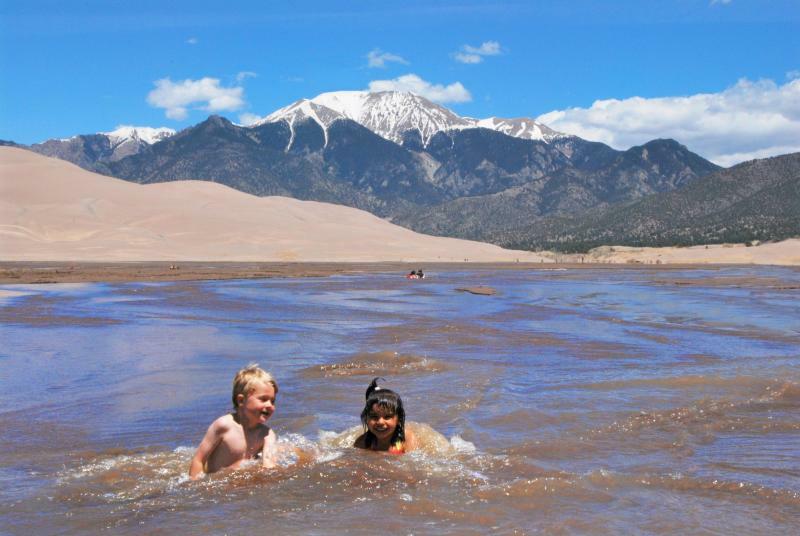 Great Sand Dunes is also a great place for wildlife watching, but depending on how your bully reacts around wildlife, you may want to keep him on a leash. Elk roam the park in fall and winter, and in the warmer months, you can see squirrels, chipmunks, and coyotes. If you enjoy bird watching and wildflowers, check out the Mosca Pass Trail. Make sure you schedule your trip with your bulldog’s heat sensitivity in mind as this part of Colorado can be dangerously hot for bullies in the summer. This park makes my top three due to an abundance of hiking trails, many of which are not too strenuous for a bulldog. The park boasts 336 miles of underground passages, but unfortunately, they are off limits to dogs. You won’t even notice though because the park also features 70 miles of dog friendly trails above ground. If you sniff around the Visitor Center, you will find plenty of hiking trails that are less than 2 miles long. I recommend that you and your bully check out the Green River Bluffs Trail, which curves through dense woods to a high point that juts out above the Green River. I also recommend that you book a room for you and your bully at the Woodland Cottages of the Mammoth Cave Hotel. For an extra $9 per night, your bulldog is welcome to join you in one of these quaint cottages that sits in a grove of shade trees near the Visitor Center. This park boasts 500 miles of trails, and they are all open to leashed dogs except for a few that have rock climbs and difficult passages. If you and your bully are into outdoor exploration, this park is a great pick. 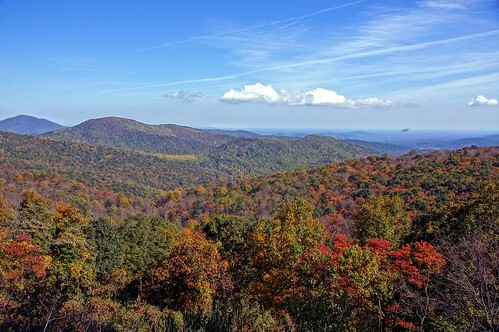 It offers back country trails, bird watching, and wildlife viewing. 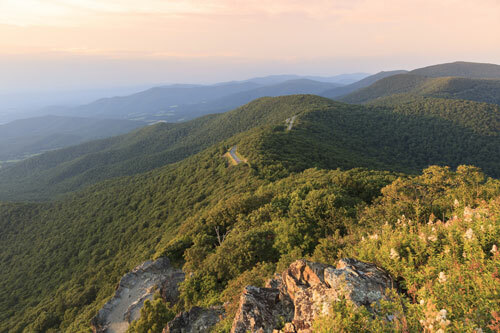 The Blue Ridge Mountains provide the gorgeous setting for this park, but you definitely want to choose your trails wisely. Some are way too steep for your bully to safely enjoy. Don’t be fooled by some of the short trails either, as a few of them are exceptionally rigorous. 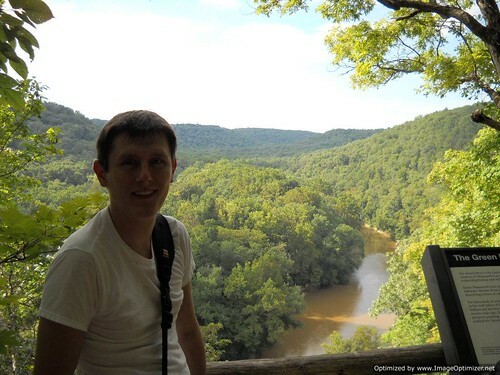 I suggest you start with the Dark Hollow Falls Trail, a 1.4 mile return hike with a breathtaking view of a 70 foot waterfall, Dark Hollow Falls. Your bully will appreciate all the trees along this hike, and all that shade means you won’t have to worry about sun exposure. Check out Skyland Lodging as they offer the only pet friendly accommodations in the park. You definitely want to make your reservations early because they only offer a limited number of pet friendly rooms. And double check your bully’s leash when you pack for your trip. The leash must be 6 ft or less to be legal in this park. Take your bulldog to this park, and he will be the only dog on the block who can say he’s visited one of the Seven Wonders of the World! You probably won’t want to plan more than a day at the Grand Canyon because dog access is limited to the 13 mile South Rim Trail that skirts the edge of the canyon. I know the edge of the canyon sounds scary to some folks, but the trail is surprisingly easy to navigate. Don’t forget to pack your bully’s leash for this trip as leashes are required on the trail. You also want to pack some extra supplies for your bulldog as the high elevation and dry climate can lead to quick dehydration for your bully. Pets are off limits in all the hotel rooms located in this park, but some of the campgrounds are dog friendly if you keep your bully leashed. There’s also a trailer village in the park that allows dogs, as well as a dog kennel located at the south rim of the canyon. The kennel is only open during the day. Roll Down the Windows, It’s Time for a Road Trip! Vacationing with your bully is an awesome way to make memories that will last a lifetime. A little extra planning is necessary when you travel with your pet, but your bulldog is totally worth it. Now pack up your gear, load up your bully, and take off on a road trip adventure!